The disaccharide a-d-Ara/-(1^5)-a-d-Ara/ comprises the core structure of the linear sections of the arabinan. A number of syntheses of this glycan nucleus, as glycosides of a variety of alcohols have been reported. 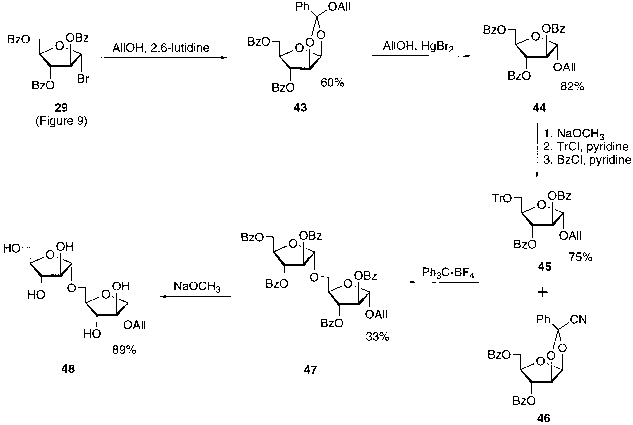 The first synthesis was of the allyl glycoside 48, which was prepared as illustrated in Figure 13 . Orthoester 43 was prepared from the bromide 29 and then rearranged to give the allyl glycoside 44. A series of protection and deprotection steps afforded the trityl ether 45, which was subsequently glycosylated with orthoester 46 (also prepared from 29). Deprotection afforded the target, 48. In the same paper, this route was used to prepare the benzyl glycoside starting from a benzyl orthoester analogous to 43. Figure 13 Synthesis of disaccharide 48: All, allyl; Tr, triphenylmethyl. As outlined in Figure 14, a more recent synthesis [55,74] of this disaccharide as the methyl glycoside (13, Fig. 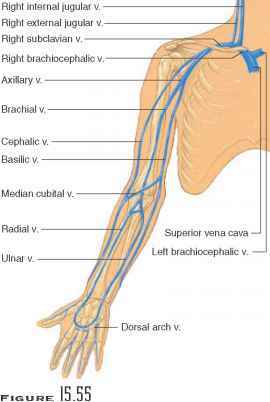 6) made use of thioglycoside donor 33. This synthesis began with the preparation of alcohol 49 from 24a, through a sequence of silylation, benzoylation, and desilylation. 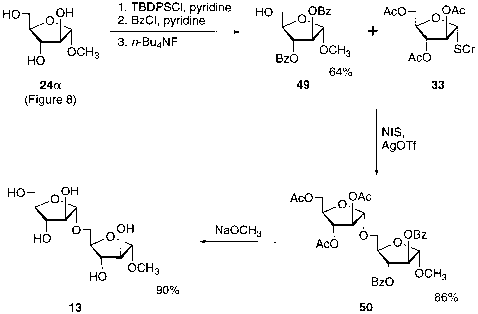 Glycosylation promoted by N-iodosuc-cinimide and silver triflate afforded the disaccharide 50, which could be deprotected with sodium methoxide to provide 13. A number of other derivatives of this disaccharide have been synthesized, namely, the 2'-chloroethyl, octyl (14), dodecyl (15), and hexyl glycosides [49,71]. These syntheses have employed either acetate 27 or chloride 28 as the glycosylating agent. The trisaccharide a-d-Ara/-(1^5)-a-d-Ara/-(1^5)-a-d-Ara/ is also a core fragment of the linear arabinan, and two synthetic derivatives have been reported. The chloride 28 has been used to prepare the S-octyl glycoside analog (17), as well as the methyl glycoside (16) . Another route to 16 is illustrated in Figure 15 . Monosaccharide 33 was converted to the differentially protected thioglycoside 51 in three steps. Glycosylation of 49 with 51 provided the protected disaccharide 52, which upon treatment with tetrabutylammonium fluoride was transformed to alcohol 53. The trisaccharide was then obtained by glycosylation of 53 with 33 and then deprotection. Four other oligosaccharides (18-21 , Fig. 6) corresponding to fragments of either the linear or the branched hexasaccharide moieties of the arabinan have been synthesized as methyl glycosides [55,74]. These were obtained in a manner similar to the disaccharide and trisaccharide via glycosylation of methyl glycoside acceptors with thioglycoside donors. Figure 14 Synthesis of disaccharide 13: TBDPS, f-butyldiphenylsilyl; NIS, N-iodosuc-cinimide; AgOTf, silver trifluoromethanesulfonate. 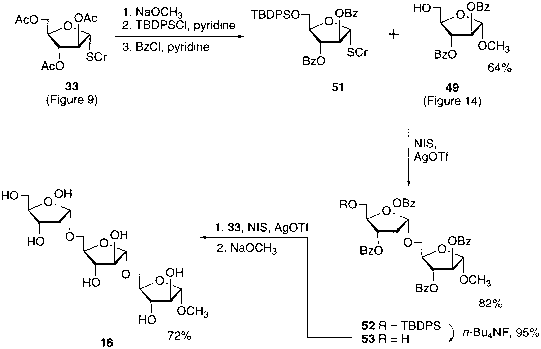 Figure 15 Synthesis of trisaccharide 16: TBDPS, t-butyldiphenylsilyl; NIS, N-iodosuc-cinimide; AgOTf, silver trifluoromethanesulfonate.